SINGAPORE — Shares rose in Europe and Asia on Friday as investors looked ahead to next week’s trade talks between the U.S. and China. China’s Commerce Ministry said the talks will be held Monday and Tuesday in Beijing. Officials hope to cool a festering trade dispute that has shaken global financial markets. European shares recouped losses from a day earlier. Germany’s DAX gained 0.9 percent to 10,506.58 in early trading Friday while France’s CAC 40 advanced 0.8 percent to 4,647.11. Britain’s FTSE 100 edged 0.7 percent higher to 6,740.38. U.S. indexes, which closed broadly lower on Thursday, were set to recover too. The future contract for the broad S&P 500 index rose 1.2 percent while the Dow future contract climbed 1.1 percent. In Asia, traders also cheered a private survey released Friday showing that China’s services sector expanded in December. China’s Caixin Services PMI, a survey of service industry purchasing managers, had a reading of 53.9 in December, a six-month high. This was a slight improvement from November’s 53.8 reading. The survey is on a 100-point scale, with 50 separating contraction from growth. It comes on the back of weak Chinese manufacturing data earlier in the week. Hong Kong’s Hang Seng jumped 2.2 percent to 25,626.03. The Shanghai Composite rebounded 2.1 percent to 2,514.87. South Korea’s Kospi added 0.8 percent to 2,010.25, while Australia’s S&P-ASX 200 lost 0.3 percent to 5,619.40. 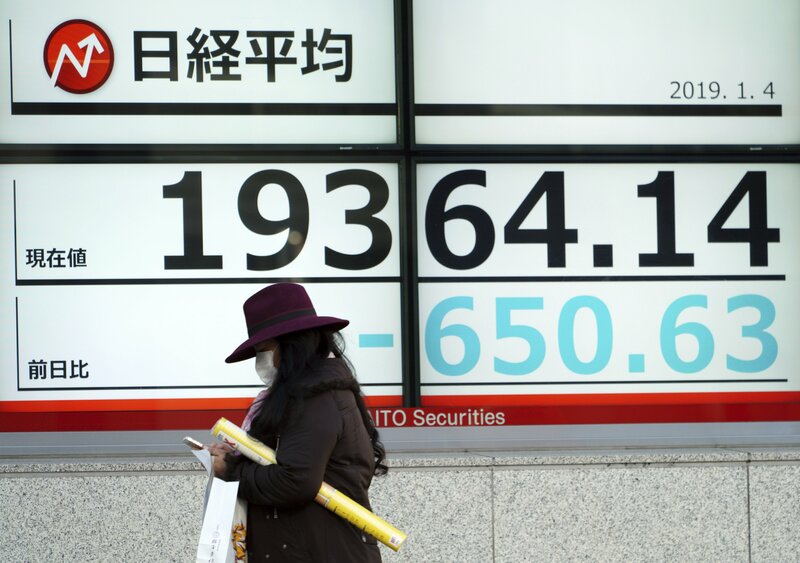 The Nikkei 225 index started its first trading day of 2019 by falling more than 3 percent. It closed down 2.3 percent at 19,561.96. Japanese technology and electronics makers slumped on Apple’s report that Chinese iPhone sales were slipping. On Wednesday, Apple CEO Tim Cook told shareholders in a letter that the company expects revenue of $84 billion in the last quarter of 2018, $7 billion less than analysts had forecast. The regional rebound in equities suggests that “Asian investors shrugged off bearish news surrounding Apple, and took this as a buying opportunity as the valuation of (the Shanghai, Hong Kong and Singapore) markets are close to four-year lows,” Margaret Yang, an analyst at CMC Markets, said in an interview. The U.S. and China have raised tariffs on billions of dollars of each other’s goods in a fight over Beijing’s technology policy, which Washington alleges is predatory. Last month, President Donald Trump and Chinese leader Xi Jinping agreed to 90-day ceasefire as a step toward diffusing tensions. Traders are keeping an eye on U.S. jobs data and a speech by Federal Reserve Chairman Jerome Powell later Friday. In other trading, U.S. crude oil added 93 cents to $48.02 per barrel in electronic trading on the New York Mercantile Exchange. The contract rose 55 cents to $47.09 per barrel on Thursday. Brent crude, used to price international oils, was up $1.05 at $57 per barrel. It gained $1.04 to $55.95 per barrel in London. The dollar strengthened to 107.93 yen from 107.67 yen. The euro rose to $1.1410 from $1.1394.